Today’s guest post features paleoanthropolgist Rick Potts, Director of the Smithsonian Human Origins Program, and Curator of Anthropology at the National Museum of Natural History. Potts sheds light on his recent dig at the site of Olorgesailie in the southern part of Kenya. Africa is known as the cradle of humanity. The reason is the amazing collection of fossils and archeological finds dug up in the layers of sediments on the African continent. These discoveries tell us about the long distant past as the human ability to walk upright, make tools, and create art came into being. Nearly all of the important developments in human prehistory, spanning the past 6 million years, took place in Africa. I visit this huge continent every year because it’s the best place to search for clues about how our species evolved. My team of excavators and researchers do our work in Kenya. 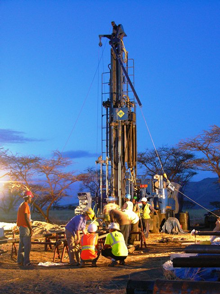 For nearly three decades we have dug every year in the Great Rift Valley of East Africa at the site of Olorgesailie, in the southern part of Kenya. Here the record of remains left behind by early ancestors stretches back 1 million years. Our digs tell us about the era of simple stone handaxes, and later on about when our ancestors began making more complicated tools. We also learn about the time when the ancestors who look like people today originated: our species, Homo sapiens. Olorgesailie is famous for the thousands of stone handaxes accumulated in ancient stream channels between 1.2 million and 500,000 years ago. The handaxe shown here is about 14 centimeters (5.5 inches) tall. Early human ancestors made these kinds of stone tools for more than a million years. This fossil discovered by my team shows the eye sockets, the brow ridges, and the forehead of a species of early human known as Homo erectus, who lived and made the handaxes at Olorgesailie 900,000 years ago. The white scale bar at the bottom is 1 centimeter long. Early humans lived in the Olorgesailie region starting around 1.2 million ago. The area today is inhabited by the Maasai people, who live by herding cows and other livestock. Our excavations at Olorgesailie allow us to find out about the habitats and animals that much earlier humans encountered, as well as the handaxe tools they made and the climate challenges they met. The landscape of the Rift Valley of Kenya where I work. The many layers of sediment show the changes that occurred in the environment as the layers of dirt built up over time. Study of these layers by geologists tells us of fluctuations in the lake that once occupied this area, and when it eventually dried up. Ash layers from nearby volcanic eruptions can be dated, providing a time line for changes in climate, plants and animals, and the ways of life of early humans. In September 2012, we began an unusual project that led us to bring heavy machinery to Olorgesailie in order to drill into the ground and extract a long cylinder from beneath the surface. The goal was to obtain an undisturbed record of ancient climate preserved in the underground layers over the last several hundred thousand of years. After a lot of effort, we succeeded getting the long cylinder, or drill core, that reached 162 meters underground (almost 2 football fields deep). Our research indicates that the core very likely represents the past 500,000 years of climate in that part of the world – East Africa – that gave rise to our species and to all people who live on Earth. 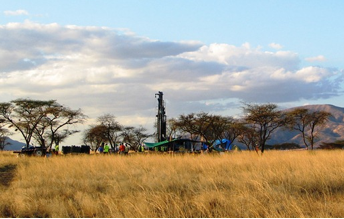 We set up drilling equipment in the southern part of the Olorgesailie region. The layers of sediments underneath the drill reached 162 meters deep. The specialized drill brought the core to the surface in segments 3 meters long, which allowed us to pack up all the portions of the core and bring them to the U.S. for study. Our team carried out drilling in both the day and night (below). 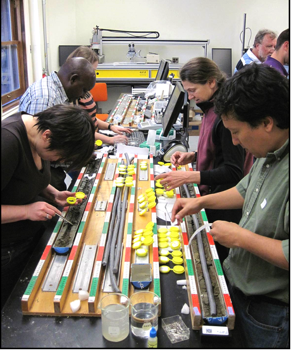 Twenty-two researchers from around the world participated in the Olorgesailie core workshop in 2013. Our research team collected samples from the core so that we can conduct many different kinds of environmental analysis, including study of ancient pollen grains and chemical indicators of changes in rainfall and temperature over time. 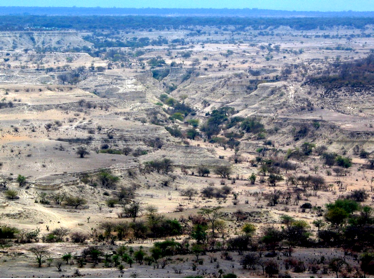 Our first analysis suggests that the core represents African climate from the past 500,000 years. Conclusion: In our study of the Olorgesailie core, the big question is whether our species emerged in a time of strong fluctuations and uncertainty in the environment or at a time of relatively stable climate. Our answer to this question may help us understand the capacity of our species in the future to adjust to new climates and environments that will inevitably arise.